The above picture represents the results from a micro-poll running on my blog recently. As you can see, I was curious about the genre the people who were visiting my blog worked in. I had a suspicion and it was confirmed by the poll. By far, the youth genre (YA and Children) dominated with a combined 32%. Science Fiction and Fantasy combined for another large chunk at 25%. The remaining 43% is pretty evenly distributed amongst the other genre's. I write (and read) in the Mystery/Thriller/Suspense arena and unfortunately there's not too many of us out here in the blogosphere. I root and cheer for the successes of all my blogging buddies, regardless of the genre, but there are times I feel like an outsider staring in because I just don't know a whole lot about their books. But I'll tell you this, the other authors in my genre should pay attention to what these other genres are doing out here...and if they're smart...they'll get their blog on! Hmmm, looks like the horror genre is lagging too. Pity. I agree with Huntress... we need to unite... brainstorm and come up with a plan to ensure the continuation/survival of our genre... before the vampires, werewolves and other entities take over completely... LOL! I think a great story is a great story. The YA I read and write has elements of romance, mystery, suspense, paranormal, etc. I'm sorry you have genre envy. I'm in the "right" genre, and still not published. I can relate. I am writing my own story in hopes to help people and offer inspiration...I don't seem to find a lot of that out here BUT it really doesn't matter. I have learned SO MUCH from all the different authors and genres. Have an awesome weekend! Interesting. Maybe it would be beneficial to switch to a genre that isn't running over 10%. I'm a mystery writer! Yay, I'm with you. I guess I am in the 1% - the religious or inspirational. Hey, D.L., I'll bet memoir falls below mystery/thriller/suspense. Ha! Most of my blog buddies write different genres from my favourite (romantic suspense) - that adds to the fun! I love all genres (I am the opposite of a book snob), but its interesting to see which genres have the most attention right now. That was a really cool graph! Great advice - brainstorming on ideas to draw attention to your chosen genre could be hugely beneficial. I wish everyone luck with whatever genre you choose to write. Ironically I follow a lot of mystery writers. That young adult is the most popular doesn't surprise me, but the fact science fiction was third does. I always feel the odd one out. So that's what you did with that poll. That's interesting. I like so many, I don't know if I fit into just one. I wonder why fantasy is on the blogosphere a lot? I'm a fantasy novelist, and I don't know that I follow many! Finally back in town for the A-Z Challenge. I've been enjoying catching up. Thanks! Great post! I read (and occasionally write) suspense and horror more than anything else, but I don't have any blogs about them. interesting...actually surprised at the results. This is interesting. What ever happened to good Ole fashioned Fiction??? That's what I want to write. I wonder if anyone would read it now! It's funny because I feel the draw to write YA because so many of my blogger friends write it, but I'm writing women's fiction right now. I've got two WIP, one is a romance that is turning into Chick-Lit and the other a thriller/mystery that is turning into a cozy mystery. None of those are high in the polls either, but it's what I'm comfortable writing. Now reading...I'm much more into heavy thriller, suspense stuff. just not ready to write it and envy those that can and do. I write literary fiction, so our genres are running pretty much neck and neck. I worried about it for a while but decided to just write what I write and see what happens. Since for the most part I also read literary fiction and mystery/thriller/suspense more than the other genres, I choose to believe the market will be there! Interesting to see the results of that poll. I happen to fall into the fantasy and the YA categories. But sometimes I wonder if maybe there are just too many of us. Then I remember that we are all writing what we love and is there ever really too much love? Interesting stats. I love a good thriller, but they're hard to find. I'm not much of a YA fantasy fan. I feel there's way too much of it. I am partial to fantasy in middle grade books, however. Horror I can take or leave. Stephen King scares me under the bed. I feel like an outsider too, because although my novella is being marketed as romance, I'll jump genres like I change socks. I'd love to describe myself as literary, but I don't think I'm deep enough for that. I'm a big mass of indecision - is that a genre? Mystery and suspense is much more difficult to write, but I enjoy reading it. Hey DL - I gave you the Sunshine Blog Award! Go to my site to find out what to do! 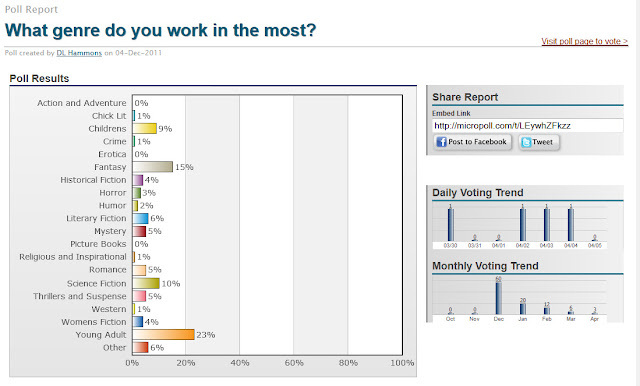 Very cool poll. I would have been added to the children's section had I participated. Happy A-Z April...thanks for hosting! I'm a roleplaying gamer, not a writer, but my genre-of-choice as both a gamer and a reader is historical fiction. A very interesting post. The poll was a great idea. Part of my problem reaching an audience is that I don't often think about what exactly the target audience is supposed to be. The first book I wrote had superheroes in it. The next one was supposed to be a quasi-young adult story, but wound up being literary fiction. The third one definitely was. My current manuscript is also supposed to be young adult, but is probably much more literary fiction...In my short stories, I'm usually far better at sticking to a specific genre. You've got me wanting to do more mystery/thriller material, just to see how it fits.